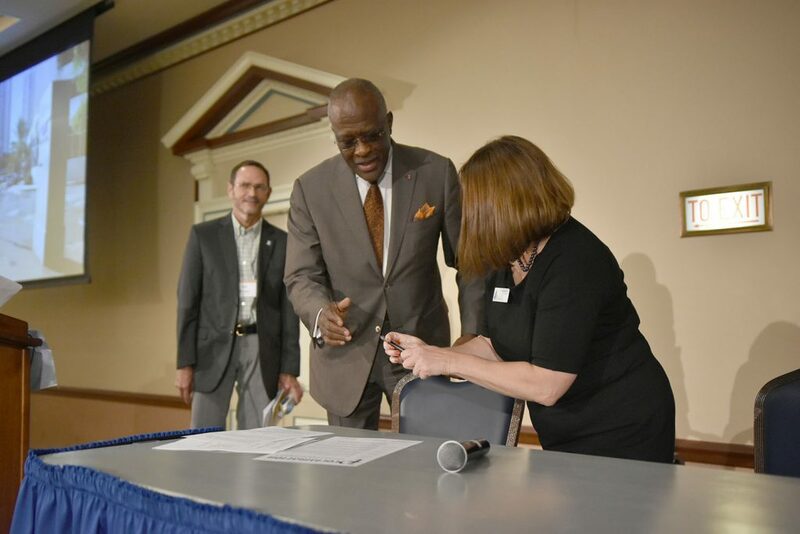 Champaign Mayor Deborah Frank Feinen hands the pen to U of I Chancellor Robert J. Jones as Urbana Councilman Bill Brown looks on during a signing of a joint climate resilience proclamation at the iSEE Congress in October 2018. As a 2016 signatory of the Second Nature Climate Resilience Commitment, the University of Illinois through iSEE created a new committee of community members and campus experts to address what must be done to prepare Champaign County for vulnerabilities to extreme weather and other results of climate change. The Champaign County Climate Resilience Task Force (CCCRTF) includes professors and subject matter experts at the University of Illinois, representatives from local organizations such as Carle Foundation Hospital, the Champaign County Emergency Management Association, the cities of Champaign and Urbana, and other relevant groups. From April 2017 to April 2018, the group developed a framework for a campus and community climate resilience assessment and planning. Task Force efforts included establishing the formal scope and vision for the committee, reviewing climate projections for the immediate region to establish what climate hazards are most relevant to the Champaign County area, and joint exercises to evaluate areas of greatest strength and need for the campus and community to prepare for climate change impacts. A resilience framework was established identifying key climate hazards and key resilience indicators for future planning. While climate change will undoubtedly impact Champaign County in a number of ways, the key hazards identified by the CCCRTF that require immediate, priority attention are extreme weather variability, rainfall flooding, severe storms, and climate-related health hazards. The first, and most pressing, was a Joint Resilience Proclamation between the University and the cities of Champaign and Urbana. This proclamation, signed in October 2018, declared a shared commitment to creating a more resilient community and formally establish a joint advisory committee to develop recommendations for future resilience planning for Champaign County. Committee members would include representatives from the campus community, the cities of Champaign and Urbana, and various state and local agencies. The second goal is to begin to monitor resilience indicators and conduct formal assessment of our current baseline preparedness. Current University of Illinois students and faculty will aggregate existing data from sources such as the U.S. Census Bureau, U.S. Geological Survey, the Federal Emergency Management Agency (FEMA), and others to comprehensively inform future evaluation. The final goal is to begin identifying short- to midterm recommendations for the University of Illinois to enhance its resilience to climate change impacts through integration with the next edition of the Illinois Climate Action Plan (iCAP). Selected members of the CCCRTF will join a larger team of faculty, staff, students, and community members in drafting the University’s road map for the 2020-25 portion of its journey toward a carbon-neutral and truly resilient future. The new Task Force members will be announced soon.